2 Do I Need to Cook Snow Peas Before Putting Them in a Salad? 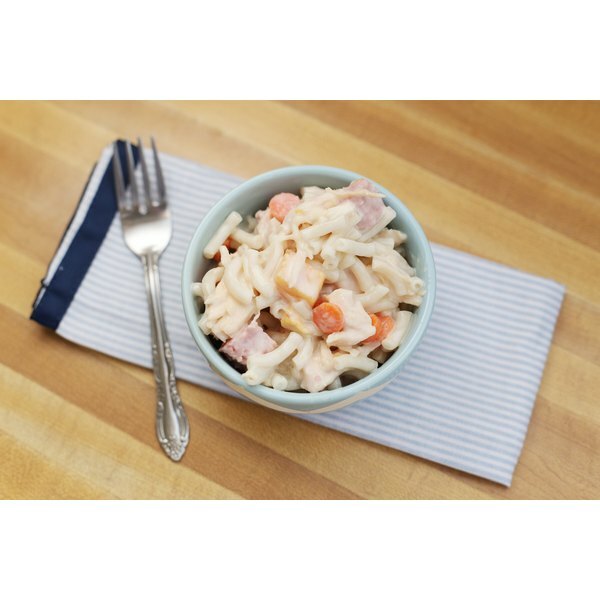 Sweet macaroni salad is typical of Filipino cuisine’s fondness for fusion, in this case combining a salad and a dessert. The simplest version requires expertise in cooking pasta only, with all other ingredients readily available canned. Add elbow macaroni to a pan of boiling, salted water and cook for roughly 8 to 10 minutes until al dente, stirring occasionally with a spoon to prevent clumping. Since the pasta will be steeped in liquid later, a little bite left in the macaroni is desirable. Drain the pasta in a colander and allow to cool. Shake gently to avoid it sticking. Mix canned fruit salad and sea coconut together in a sieve with a spoon, and allow the excess syrup to drain. The coconut should be easy to find in an Asian supermarket. Transfer the cold pasta to a mixing bowl and pour on a dash of cream and most of a can of condensed milk. Mix well with a spoon. Add the fruit salad and coconut and mix further. Place in the refrigerator and cool for 30 minutes, then serve. Boil thawed chicken breast in a pot of salted water, simmering gently for 10 to 15 minutes until cooked through. Alternatively use canned chicken breast. Drain the water through a colander, allow the chicken to cool and shred it with your hands. Place a carrot on a chopping board, peel it and dice with a sharp knife. Bring a pan of salted water to a boil on a stove top and blanch the diced carrots briefly for less than a minute. Drain through a colander and plunge immediately into a bowl of cold, iced water. Bring another pan of salted water to a boil and add a packet of elbow macaroni, cooking for around 8 to 10 minutes until tender. Drain through a colander and allow to cool. Whisk together mayonnaise, condensed milk, a dash of cream and a dash of cider vinegar in a mixing bowl. Open a can of fruit cocktail, drain off the syrup and add to the bowl. Add the diced carrot, having drained it through a colander. Open a can of cooked ham and dice into cubes on a chopping board with a sharp knife. Add the ham to the mixing bowl, along with cubed cheese such as Edam, if desired. Transfer the cooked macaroni to the mixing bowl with the other ingredients, add the shredded chicken and work together with a spoon until the pasta is covered. Store in the refrigerator, covered with plastic wrap, but consume within a short period before the liquid turns watery. Substitute canned young coconut meat for sea coconut if necessary, since the latter might be hard to track down. Desiccated coconut lacks the jellylike smoothness and pleasant sour flavor of the other two, but is a more palatable option for those who don't like sea coconut's texture. Use a separate chopping board for cutting cooked meats and raw vegetables and cheese.